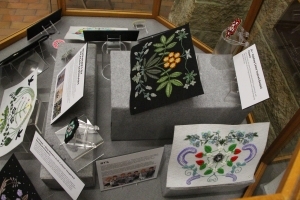 Meagan Barnhart is a Mississauga Ojibwe (Anishinabe)/ Cayuga (Haudenosaunee) artist from McKerrow, Ontario and a Cultural Heritage Conservation and Management student at Fleming College. An exhibit featuring Meagan’s 7-piece bead embroidery series inspired by K-pop group BTS (as well as 10 smaller beaded flowers), is temporarily on display at the Huron County Museum. Curator of Engagement & Dialogue Sinead Cox interviewed Meagan to find out more about her creative process and the development of her technique. You can see Meagan’s stunning work at the museum until February, 2019. When did you start beading? What made you want to start? I started beading when I was really young. 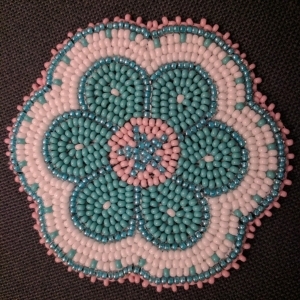 My mother beaded a lot and she often got me to sort out beads that were mixed together in a cookie tin. She first started teaching me by doing bead loom work and simple jewellery. 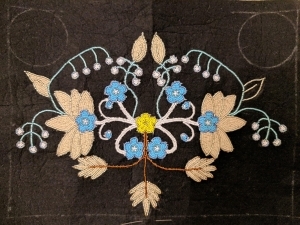 However, once her eyes started to bother her while she beaded and circumstances changed in our family, beading went out of my mind. It wasn’t until many years later in my late 20s that my passion was reignited when I did some volunteer work at the Woodland Cultural Centre. For one of the months I was there I worked in the Education department – I didn’t have much knowledge that I could offer unfortunately, so I was asked to do some beadwork for game prizes. 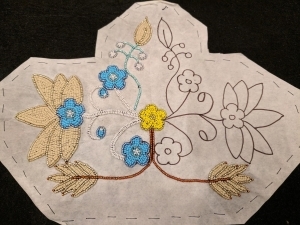 From there, I moved to Gatineau, Quebec where I got an internship at the Canadian Museum of History for Indigenous, Inuit, and Metis peoples who are pursuing training in museum work (Aboriginal Training Program in Museum Practices); it was there where I learned how to do bead embroidery, which I commonly do now. I was influenced by many things: my surroundings and colours. 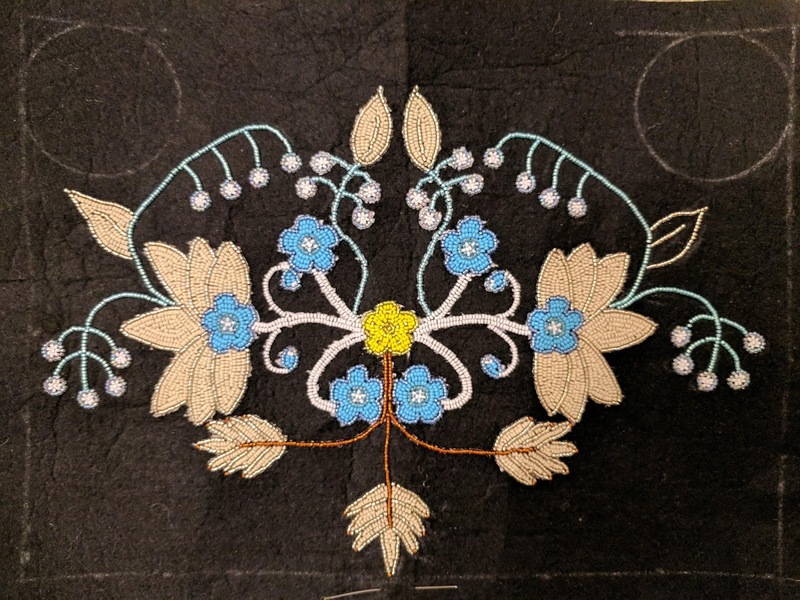 I was exposed to a lot of beadworks at the museum, and I thought to myself that I would love to be that good and it excited me at the possibilities of being able to create something beautiful and calming. I was not only influenced by the beadworks but colours and emotions as well. The work on display is inspired by the K-pop (South Korean pop) band BTS-can you explain when you became a fan of BTS, and why they are such inspirations for your work? For me, at this moment, beading and BTS kind of go hand-in-hand because it was when I started beading in 2016 [that] I also began to call myself an ARMY (Adorable Representative MC for Youth)–their fandom name. How has your technique/artistry evolved? I really still use the same materials I always have…only they are a bit better quality now. 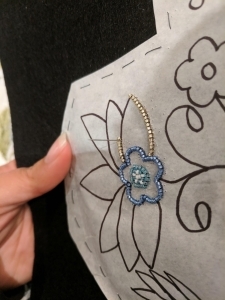 I would like to experiment on more types of materials, but I am only new to my beading (almost two years now, but I still consider myself new and learning). As of right now I don’t have any other beaders close to me to discuss new techniques or tips. So its slow learning, but I gradually pick up new techniques every once in a while – especially when I feel daring enough to step out of my comfort zone. 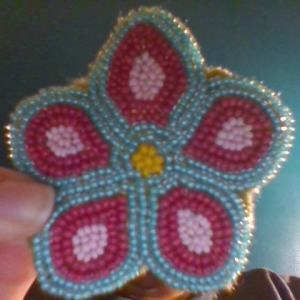 “Suga ~ Nevermind Colour Inspired Beaded Flowers”: Meagan’s first attempt at a raised beadwork in progress. For example, my raised bead work: I [had] only been taught once how to do a raised beaded strawberry while working at the Woodland Cultural Centre, but [after] that…I felt comfortable with bead embroidery; I ventured on my own to try different techniques with raised bead work. I think I still need to practice a lot with this style and I would benefit greatly in the future having a friend or two around that I can discuss such things with. When it comes to the evolution of my BTS colour inspirations, I started out small – using the colours to make single flowers instead of larger pictures with them. 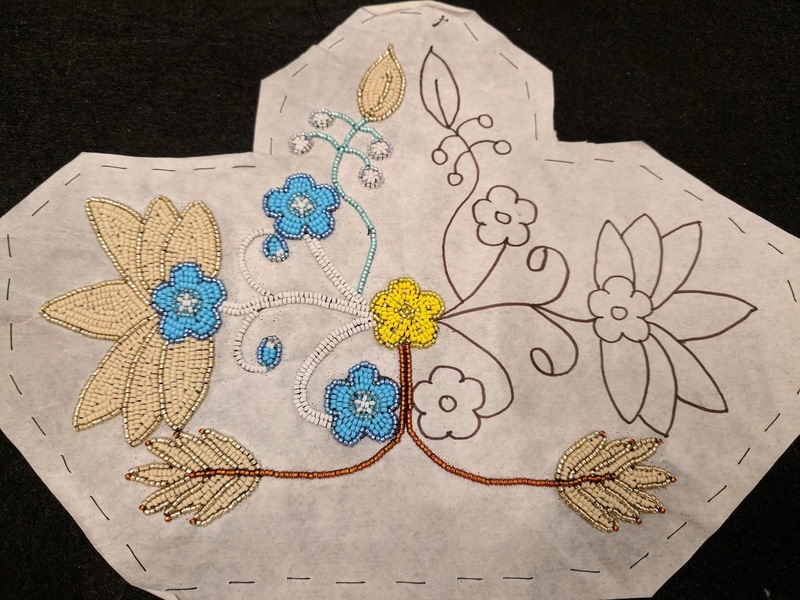 Who taught you beading/how did you learn? I learned how to bead embroider when I was at the Canadian Museum of History from a fellow intern friend who is Métis. Her sister is a beader and invited me to go [to] an evening bead workshop. Unfortunately, it was [so] far by bus to get to the workshop that I only was able to spend less than a half hour with them – and from then on was not able to continue going to the classes. However, this was enough time to teach me the basics and…me and my two fellow intern friends continued to bead on our lunch breaks. Can you briefly take us through the process of designing the seven pieces in this series? First I watched the Music Video, then I chose a scene that captured my attention. I then read the lyrics, analysed any imagery within the entire music video to get a sense of what the storyline was – if there was a book, or movie related to the music video or even the series that the music video is apart of (School Series, WINGS Series, Love Yourself Series), I’d read or watch then to get a sense of what the entire series was about…With [each] scene I choose, I pick the colours that were most dominant in the image and choose flowers based on them. For the flowers, I often tried my best to try to use wildflowers of North America, specifically ones I’m most familiar with in Canada…I would research the meaning of the flowers or what their uses were – if I already knew what they represented or what they were used for, the better. 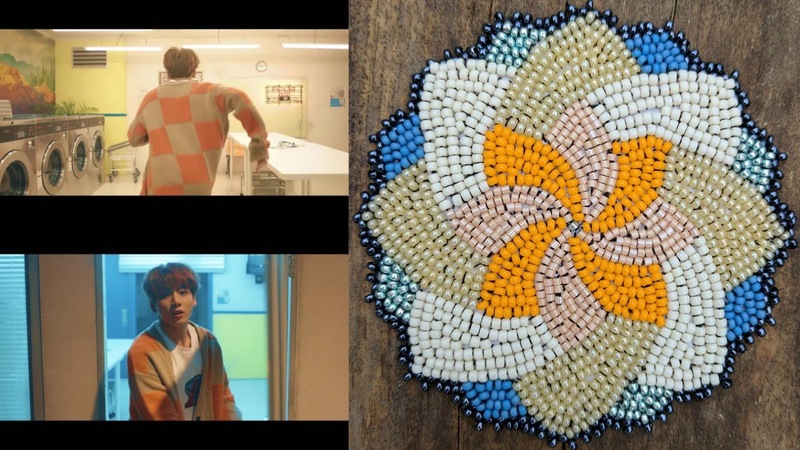 I wanted to choose flowers that would tell a story – something that related to the music video, or BTS’s relationship with their fandom ARMY – especially since their bond is a lot stronger than I have ever seen between artist and fandom. From there I would develop a pattern. 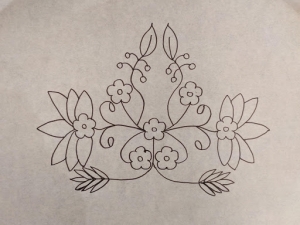 I often enjoyed the somewhat-symmetrical design; I say somewhat, because although it looks symmetrical, nothing is ever perfect, and neither are they, they don’t line up perfectly and they don’t have the same amount of beads on each side. I use 15/0 glass seed beads (for the bigger pictures to get more detail). For the singular flowers I mostly use 11/0 glass seed beads, but i mix them sometimes with 15/0 seed beads, 10/0 seed beads, and 11/0 delica seed beads. For the substrate I use 100% polyester felt (more recent ones are made with a stiff felt – as are the big pieces), and either nylon, polyester, and/or cotton thread (I prefer nylon and cotton over polyester for thread because they do not tangle as much), and a 16/0 beading needle. I draw on tracing paper and bead over it. Once the beading is done, I remove the paper as much as possible/visible. 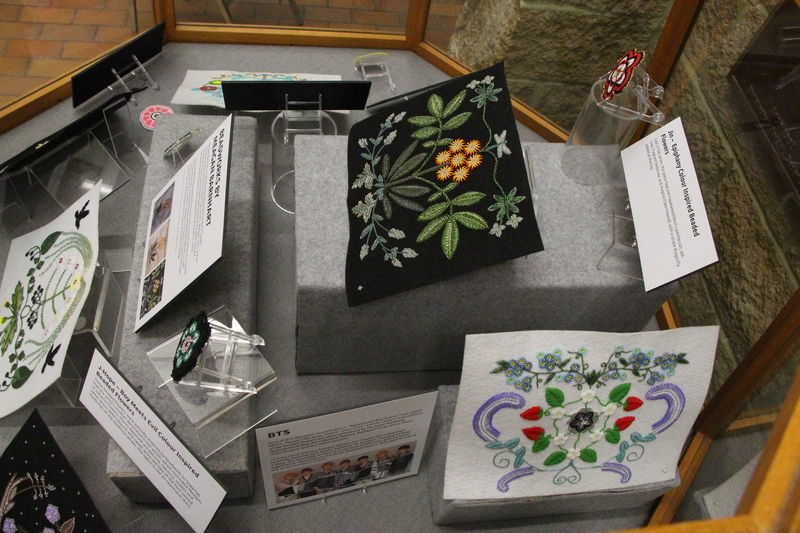 How long did it take you to bead the pieces on display? 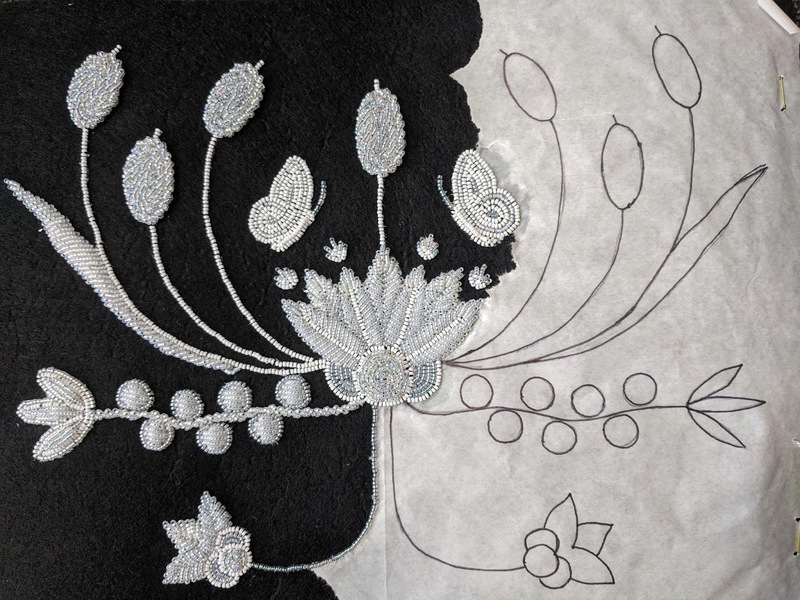 For the singular flowers, around 12 hours (it can be more or less depending on size and my familiarity with the pattern I am using), and for the larger pieces I would say around 150 hours (more or less, depending on the amount of difficulty and style). For the full series of the large pieces, the entire project took me a year, practically to the day. For the smaller flowers, that series has almost been a year long as well – I believe my year will be up in November. This year has been full of many projects (not just these ones), so that may have contributed to why these series took me so long to complete. What’s the most difficult part of creating beadworks? Conversely, what’s your favourite part of the process? Sometimes the amount of detail you want doesn’t show through, and you will never know until you start. There [were] a few times when I envision[ed] something, made it halfway through my design and had to alter something because it wasn’t working out the way I planned or it wasn’t looking the way I wanted it to. Eye strain is another difficult thing to control as well, especially when you are really focused. One of my favourite parts is the relaxing feeling it gives me – it’s almost like meditation at times. I also really enjoy seeing the outcome of it all. Do you have a favourite piece that you’ve created so far? Each one has a particular place with me when it comes to the big ones [from the series] – However, I think my first one, Serendipity, holds a special place in my heart. It’s not my best one, but it is my first attempt at doing anything so ambitious. I also remember how much i loved that song and music video when it came out – I still do really. There was a lot in this music video that reminded me of what my dreams look like when I sleep, and my first thought was that I really wanted to capture that feeling by capturing the colours. When I look at it, I can see things that I could have done better – even with the story telling I have with the flowers, but instead, these flaws make me smile and i love it just the way it is. 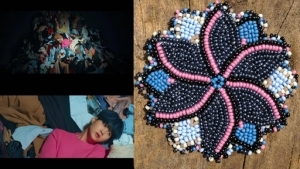 “JIMIN ~ Serendipity Colour Inspired Beaded Flowers” Flowers are lily of the valley, buttercup and periwinkle. The two circles (unfinished in this image) represent the sun and moon. [BTS member] Jimin is also my bias [a fandom term for preferred member of the group], so that may have something to do with my gentle lean towards Serendipity – it is his solo intro song that inspired me to do this series. Is there a story or message you hope your work conveys? Surround yourself with positivity – beauty, happiness, serenity, peace – appreciate your hard times, they will help you recognize the good in even the smallest form if you allow it to. Where can people follow you & your work? Meagan’s work will be on display in the museum lobby October 2018 through February 2019. All photos for this piece courtesy of Meagan Barnhart.